Honeywell recently announced a potential defect with their BG-10 series pull stations. These pull stations were manufactured from 1992 through 2010 under multiple brands including ADT, Fire-Lite Alarms, Johnson Control Inc. and Notifier. Over time, deterioration inside the devices can occur, preventing the pull stations from transmitting an alarm signal when activated. Examples of the BG-10 pull stations are provided below. All BG-10 series pull stations will look similar to those shown. Several options are available if you determine that you have one of these devices. Replace the pull station with the newer model BG-12 pull station (recommended by Honeywell). The recommended substitution based on your exact model along with pictures and datasheets can be found here. New, addressable indoor pull stations will likely cost around $100 per device to replace, not including the labor to install it. Replace the alarm switch seal (provided free of charge) during the next scheduled testing and inspection session. The testing and inspection of pull stations is required on an annual basis and is most likely provided by a fire alarm contractor during the annual inspection and testing of the fire alarm system. Information on this process can be found here. Honeywell recommends that this process only be performed by a qualified fire alarm service provider as opening the pull station without taking adequate precautions will set off the fire alarm system. AHCA/NCAL has made the issue of Observation Stays one of its top advocacy and outreach priorities. Our efforts include supporting the Improving Access to Medicare Coverage Act of 2013, which ensures observation stays count toward the Medicare-required three-day hospital stay, and connecting with key members of Congress to support this legislation. To boost our efforts, we need your help in collecting stories and/or names of those beneficiaries who have been impacted financially and emotionally by this observation stays issue. We will use these stories on our website and in meetings on Capitol Hill with members of Congress as we work to garner support for H.R. 1179 and S. 569. If you have a story to share with AHCA/NCAL or the name of a beneficiary you could pass along who has been impacted by this issue, please e-mail Claire Krawsczyn. AHCA/NCAL can contact the beneficiary directly to get his or her story should they be willing to share it. All who share their experience must sign the authorization form in order to give AHCA/NCAL permission to use the individual’s name, story and picture should they chose to submit one. For more information on this issue, please feel free to contact AHCA/NCAL or visit the Observation Stays page on www.ahca.org. The recently updated observation stays issue brief can be found here for your reference. Hurricane Season is just about a month away, and it is important that everyone prepares for the season, as storms can cause havoc to all states in its path once on land. AHCA/NCAL has prepared some basic steps to make sure that you, your facility, and most importantly, your residents and caregivers are ready with disaster plans in place. In addition, it is important that you know which staff members will come in during a storm. Ensure that staff complete a form of their needs at hire and again once every year. In addition, if you have to evacuate, have a good resident tracking form in place. This can be done very easily, by using an excel spreadsheet, with the name of the resident, name of bus/ ambulance company, bus/ambulance number, name of driver and where the resident was to be taken. Having the name and number of the bus/ambulance and name of the driver/company is important in case the resident is taken to another location due to surge issues. As we have seen with the recent events in Texas, practicing your plan is imperative to a successful implementation. Practice with staff: they need to understand where to go and how to react to an event. AHCA Red Envelope—Use this in case you need to evacuate your building and have all important resident documents in one place. Dementia care- This document is designed as a guide for non-clinical staff who become involved in direct patient care during a flu pandemic or other emergency. Ethic Guidelines- Planning processes that include careful consideration of ethical principles for disasters and emergencies in long term facilities will assist staff in responding to crisis situations from a perspective that is fair and just. CMS emergency planning checklist—this is not required but recommended, a good resource when reviewing your plan. This week, the nation experienced two tragedies. AHCA/NCAL has received many inquiries as to ways the long term care community can help. Our thoughts are with the victims of this week's events, their families, and all of those impacted by the events. The media has covered these events daily, some with a focus on the particular vulnerabilities of individuals in nursing facilities and the heroic staff members who were there for them. Watch the the video below about the story of one Texas nursing home worker and her experience during the West, Texas, facility explosion. AARP also posted an article on how to best learn about an evacuation plan at long term care facilities. West, Texas: On Thursday, a fertilizer plant in West, Texas, caught fire and exploded, leaving at least 15 dead and more than 160 people injured. Of particular concern was our long term care family at AHCA/NCAL member facility West Rest Haven. Thankfully, the nursing home was safely evacuated and the residents who were evacuated are being cared for in eight nearby nursing facilities. One nursing home employee describes her actions throughout the explosion. Click here or on the video image to the right to watch. There is a need for clothing for almost 140 residents.Authorities are reporting that local hospitals are well staffed and equipped to handle the patients at this time, but they need blood donations. Staff at the Department of Aging and Disability Services, Long Term Care Regulatory, is coordinating other offers of help for the facilities and others in the community. Their central point of contact for offers of resources is Alice Powell; 512.438.4664. The Texas Health Care Association will keep AHCA/NCAL apprised of new developments. For more information, visit www.txhca.org. Earlier this week, the Senate Committee on Finance held a hearing to consider the nomination of Acting Administrator of the Centers for Medicare and Medicaid Services (CMS), Marilyn Tavenner. During this hearing, Senator Schumer (D-NY) raised the issue of Medicare beneficiaries’ access to skilled nursing facility (SNF) care being constrained by the increased use of extended hospital stays in observation status. Sen. Schumer is a cosponsor of the Improving Access to Medicare Coverage Act of 2013 (S. 569), which aims to ease access to skilled nursing care for Medicare beneficiaries following a hospital stay. In order to access the SNF benefit under Medicare Part A, patients currently must be admitted to a hospital for at least three days. S. 569 would deem time an individual spends under observation status eligible to count towards satisfying the three-day requirement. Senator Schumer addressed the key importance of what this legislation would accomplish and specifically asked Tavenner if there is a way without Congressional action that CMS could administratively fix this issue. Tavenner responded that she would be happy to work on this issue. AHCA has long advocated that all days spent in a hospital, regardless of “inpatient” or “observation” status, should count toward Medicare’s three-day hospital stay requirement. AHCA has made the Improving Access to Medicare Coverage Act a top priority and has been meeting with members of Congress to garner support for it. In addition, AHCA is part of a coalition that consists of key health care groups, such as the Center for Medicare Advocacy, Inc., and AARP, who are advocating for this important legislation. Senator Sherrod Brown (D-OH) introduced S. 569, and Representatives Joseph Courtney (D-CT) and Tom Latham (R-IA) introduced companion legislation, H.R. 1179, in the House of Representatives. AHCA will continue to provide updates on this important matter. Last month, CMS issues a Survey & Certification memo to alert providers about Luer tubing misconnections events. Serious events have occurred from wrong tubing connections leading to delivery of incorrect substances or by incorrect routes of administration. A Luer connector is a fitting for syringes and needles to connect medical devices like IV, enteral, respiratory, etc. components and accessories. Adverse events associated with this connector have occurred. For example, a feeding tube mistakenly was connected to a patient’s ventilator in-line suction catheter and resulted in the delivery of the contents into the patient’s lungs. CMS recommends that until Luer connection replacements can be fully implemented, try to find an alternative device, have clinicians trace lines back to their origin to ensure correct connection, and position catheter and tubes having different purposes on different sides of the patient’s body. On Tuesday, AHCA/NCAL submitted a statement for the record to the Senate Committee on Finance on the nomination of Marilyn Tavenner to Acting Administrator of the Centers for Medicare and Medicaid Services (CMS). Tavenner has been serving as Acting Administrator of CMS since November 2011. AHCA/NCAL have been vocal supporters of Ms. Tavenner's confimation and reiterated that support in the statement issued on Tuesday. The U.S. Department of Health and Human Services (HHS) announced that for “transitional purposes” it will delay by one year (until 2015) the Small Business Health Options Program, known as SHOP , that gives employees of small businesses a choice among health plans obtained through the new exchanges created in the Affordable Care Act (ACA). Small-business employees will still be able to get insurance, but the states have the option to limit that to one choice - rather than a variety of plans - for the first year. In 2015, these employees will be able to choose from the full range of plans in the marketplace. SHOP was designed to simplify the process of finding health insurance for small businesses. The health insurance plans available in the program will be run by private health insurance companies, the same way small group plans are run now. Small businesses can chose the level of coverage they will offer, and define how much they will contribute towards their employees’ coverage. Stay tuned for more details on an educational SHOP webinar for AHCA/NCAL members that will occur this summer. The Affordable Care Act (ACA) requires that each nursing center in the nation develop a Quality Assurance/Performance improvement (QAPI) program. CMS is currently developing the regulation that will implement this section of the ACA, and AHCA expects it to be published by 2014. Once the regulation is finalized, facilities will have one year to implement it and have a QAPI program in place. But there is no reason to wait and watch from the sidelines - many facilities across the country have already started incorporating QAPI principles into their facility and are using them to structure their quality improvement programs and achieve better results. The time is now to prepare for QAPI! The LTC Trend Trackersm tool, a free AHCA member benefit, allows organizations to benchmark their hospital readmission rates using the most current national data available. Announced at this year’s Quality Symposium, LTC Trend Tracker now has the rehospitalization measure OnPoint-30®, which is calculated using MDS 3.0 admission and discharge assessments. And as of late March, users now have access to results for third quarter 2012 and prior. This risk-adjusted measure is a valuable resource to members for use in discussions with hospitals and other potential referral sources as the focus on of reducing rehospitalization rates continues to increase across the nation. Now compare the actual and expected rates to your risk-adjusted rates. 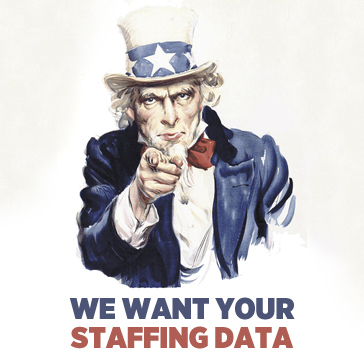 AHCA/NCAL is currently collecting data on Vacancy, Retention, and Turnover of staff through two national surveys, one for assisted living and one for skilled nursing centers. Your response to these surveys is essential to enable your own benchmarking and quality improvement efforts and to help AHCA/NCAL to provide information demonstrating the quality of care delivered in our long term care communities. The Centers for Medicare and Medicaid Services (CMS) identified reducing the off-label use of antipsychotics in nursing facilities as a top priority in 2012. With the help of our dedicated nursing staff, physicians, our consultant pharmacist, and support from administration, Lakewood has achieved excellent results in this national goal. The national average was scored at 24%, the state average 27.2%, our top performing peers at 20.30%, and Lakewood scored a remarkable 7.2%. There is no role for use of these medications on an as-needed basis only since it takes 3-7 days before the antipsychotic effect starts. Use of these meds for three months or more is assessed for discontinuation or gradual dose reduction. Patients admitted on these medications without a clear indication or on low dose are given a trial off these meds. We implemented a review process to ensure that all antipsychotic scripts are critically evaluated soon after they are written. What was done to try to figure out why the resident is having behaviors? What might the resident be trying to communicate to us (an unmet physical, emotional, or psychosocial need)? What do we believe the reason was for the resident's behavior (many times the answer is found in staff approach)? And, what alternate approaches were tried before requesting these medications? As we continue to learn how to evaluate problem behaviors in dementia residents and identify non-pharmacological strategies to treat these behaviors, we are proud to provide top quality in the delivery of care. Share your facility's quality improvement journey with us! Safely Reduce Hospital Readmissions: By March 2015, safely reduce the number of hospital readmissions within 30 days during a SNF stay by 15%. Safely Reduce the Off-Label Use of Antipsychotics: By December 2012, safely reduce the off-label use of antipsychotic drugs by 15%. Increase Staff Stability: By March 2015, reduce turnover among nursing staff (RN, LPN/LVN, CNA) by 15%. Increase Customer Satisfaction: By March 2015, increase the number of customers who would recommend the facility to others up to 90%. So how are we doing? One way we have to assess that is by listening to the stories we hear from you, our members, sharing about the work you are doing and the results you are achieving in your individual facilities and organizations. For just one example, see Cathy McKay’s story about the impressive progress being made in reducing antipsychotic use at Lakewood in Waterville, Maine. Another is by looking at the data we have available. For each of our goals, our ability to determine progress at a national level varies. Carbapenem-resistant Enterobacteriaceae (CRE) is a family of antibiotic-resistant bacteria including Klebsiella species and E Coli (Eschericha). The bacteria are a normal part of the digestive system that can become Carbapenem-resistant. CRE affects people in healthcare settings who have other conditions like: on a ventilator, have catheters, IVs, and people taking long courses of antibiotics. More information is available on the AHCA website. Isolate infected individuals or cohort them with individuals who are not immunocompromised and who are continent of bowel and bladder. It is not recommended to cohort an infected person with individuals who have an indwelling catheter, IVs, tracheostomy, and wound drainage. Use of Personal Protective Equipment (PPE), like gloves, gowns when cleaning-up body fluids, mask/eye/nose protection when splashing is anticipated for all staff coming in contact with the infected person. All staff and the resident adheres to hand hygiene protocols before and leaving the resident’s room. Timely communication of staff to let them know the resident is infected with a multidrug-resistant organism (MDRO) and to notify staff when the individual is being transported out of room. For individuals who need therapy and have uncontrolled secretions and excretions, provided therapy in the resident’s room. Use resident-dedicated equipment or single use equipment and clean-up immediately after use. For therapy that cannot be done in the resident’s room, schedule therapy at the end of the day – last session and prior to transport notify staff, contain incontinence and wound drainage, and make sure all staff and resident clean hands prior to leaving the therapy room. Also, use resident-dedicated equipment and clean equipment immediately after use. Educate staff on MDROs, prevention and management. For individuals visiting an infected person, ask them to wear a gown, gloves, and mask if splash anticipated and if providing care. Remind them to wash their hands when entering and leaving the room and to avoid visiting other patients. The implication of CRE infection in LTCFs requires monitoring antimicrobial use, minimizing the use of urinary catheters, and leaving catheters in place only as long as they are needed. Care givers need to be alert to noting signs and symptoms of possible CRE infection. Use tools like the INTERACT Stop and Watch and Change in Condition File Cards to identify and communicate suspected symptoms and changes in condition. For more information on CRE prevention, see the CDC Guidancefor Control of Carbopenem-resistant or Ebterobacteriaceae. For more information about the FLSA, go to http://www.dol.gov/whd/.